I'm a sucker for skin care. I hardly buy make up, but I will splurge on anything that promises smooth supple skin! I am from the school of thought that a girl does not need make up if she has great skin to start with. Sure, make up accentuates nice features, but I would rather accentuate healthy glowing skin. I think I got this mindset from my mom. She's the one who got me obsessed with French chic in the first place. When I was into my teens, she would often tell me, observe French women, they look so effortless, with barely a trace of make up, so natural, etc. etc. and thus became our standard of beauty. Effortless, natural, and always alluring. But of course, effortless and natural beauty requires a lot of work! The secret is to not let others on that it takes time and money (well, not a lot apparently, my mom once came home raving about this girl with smooth rosy cheeks who was selling at a fruit stall at the wet market. She just had to ask the girl what product she was using, "Chin Chan Sui" was the reply) haha! But as our theory goes, the foundation of beauty basically is glowing skin and gorgeous hair. Once attained, any woman becomes attractive. Really. Well, heaps of confidence helps too! When I got pregnant, I realized there were limitations to my skin care routine. No more peeling products that I stocked up on, I had to say goodbye to the wonder antibiotic that my derma prescribed for stubborn zits, and I just had to make sure that every product that touched my skin was pregnancy friendly - no alcohol based toners, salicylic and alpha/beta hydroxy acids were dubious, strong smelling shampoos and lotions made me dizzy...pretty much a lot of stuff had to be avoided if I wanted to play it safe. This skin thing turned out to be quite a challenge but I was not going to take any chances. For a while, I made do with just Cetaphil and my moisturizer. I washed my hair with Johnson's Baby Shampoo. But well, I felt I was still compromising my beauty routine (heehee). So I gradually shifted back to using my trusted toner and facial treatment essence that were alcohol and perfume free. That made me happy. But I had yet to find a body lotion that won't make me nauseated from the smell. 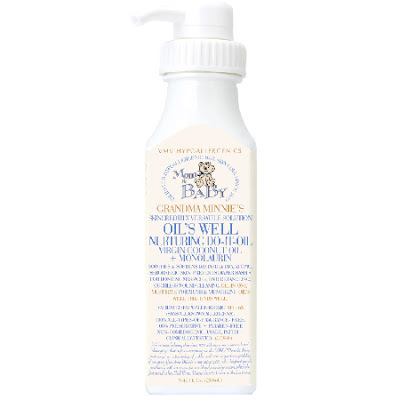 So when I re-discovered VMV and their hypoallergenic line of pregnancy & lactating friendly products called Grandma Minnie's Mom + Baby Skin Care, I considered my prayers answered! Finally! Products that I have no second thoughts of using, plus its a line I can share with our Little One! 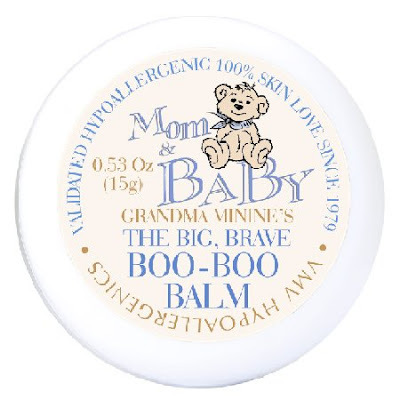 - For baby’s face and body. For mom-to-be’s itchy/stretch-mark-prone skin. Soothes and softens even very dry, atopic skin. Gentle-yet effective antibacterial disinfection and antioxidant benefits. For daily moisturizing, protection, itchy belly relief, and infant massage. - Contains organic virgin coconut oil (because its fatty acids are native to skin, this oil is exceptionally soothing and effective as a moisturizer) + coconut-derived monolaurin (a very gentle-yet-powerful antibacterial disinfectant). - Treats infections that can occur in skin damaged by eczema, dermatitis, psoriasis, herpes, wounds, cuts, grazes, insect bites, minor burns etc. - Formulated specifically for babies. - This tender hair + body wash contains monolaurin for very gentle-yet-effective daily antibacterial protection (gentle as this Wash is, it’s a real clean) and green tea for antioxidant benefits. - pH-Balanced so it’s both tear-resistant and exceptionally kind to even very sensitive, atopic skin. - Sweetly yet thoroughly washes away dirt and build-up without drying out skin or hair. - Rinses clean: leaves no harmful residue. 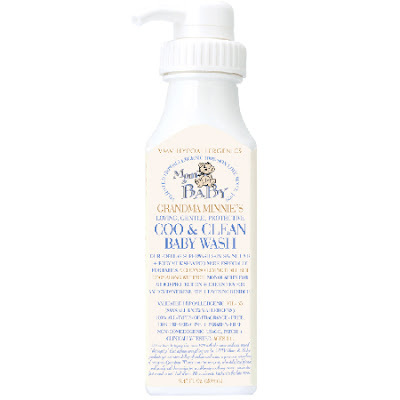 - For hair + body so it’s quicker and more convenient for busy parents or babies skeptical of baths. - May also be used directly on baby’s hands + feet. - Ideal for use in homes, nurseries, hospitals, clinics, daycare, schools, after play dates or visits to the doctor: any place or time where the spread of infection is a regular risk. If you'd like to try the Grandma Minnie Mom + Baby skin care line, I suggest you take advantage of the 20% off sale on VMV's Holiday Baby Bundle (pictured at the top of this post). It's a complete, travel-sized care set that includes all five products I've mentioned above. Not bad at $52 for the entire line (a $75 value), and it comes in a gorgeous box too! Anybody care to send me this? Hahaha! Oh, and remember to visit the VMV site the whole month of March for Grandma Minnie's 1st year anniversary and watch out for special promos! I know I will! I've never been this excited for a skin care line the same way I can't wait to buy and use La Mer eye cream! Heehee! I love baby products, they always smell the best. Awww, a baby that smells like a coconut macaroon! How yummy! Come to think of it, they do vanessa! I guess that's why I've always loved Johnson's baby cologne, Nenuco and Denenes. You are spot on! I was just wondering what was the "peeling products & wonder antibiotic" for zits you mentioned. I have a problem with adult occassional, pre-menstrual zits :-( Need help. Thanks!